Magnolia Court, located on a typical Southern California suburban arterial road, provides sixteen units of affordable housing in a courtyard setting. The western half and rear of the project has three-story town houses with tuck-under parking accessed via driveways. The eastern half of the project features two-story townhouses with garages located at the rear of the lot. These townhouses have two fronts, with one public room facing the courtyard and another facing the street. 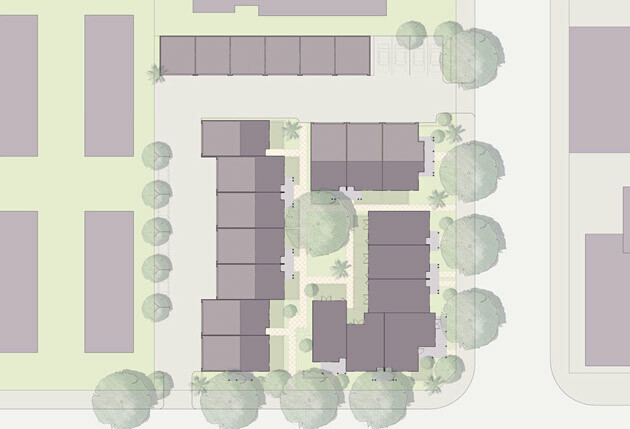 This mix of typical and unique unit plans and varied parking arrangements is critical to ensuring the contextual fit of courtyard housing. It is also starkly different from the mechanical repetition of relationships between building, open space and parking typical of modernist housing design. The fabric of the building is governed by the roof configuration of all three clusters, ensuring porch-fronted, house-scaled, massing of varied detail and finishes on both streets.